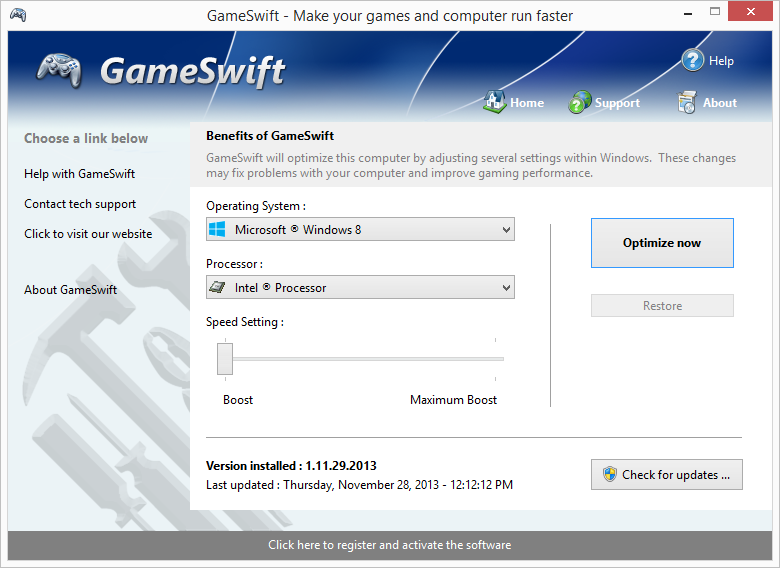 For so long as the Software is the most current version of GameSwift distributed by PGWARE, you may give exact copies of the evaluation Software to anyone. You may not charge any fee for the copy or use of the evaluation Software itself, but you may charge a distribution fee that is reasonably related to any cost you incur distributing the evaluation Software (e.g. packaging). You must not represent in any way that you are selling the Software itself. Your distribution of the evaluation Software will not entitle you to any compensation from PGWARE. You must distribute a copy of this license with any copy of the Software and anyone to whom you distribute the Software is subject to this license. You may not remove any copyright, trademark or reservation of rights language displayed on, in or with the Software. You may also not include any registration number, serials or methods to circumvent the Software protection mechanism.